There are times when I think getting through “Just Another Day” will be an accomplishment. Dan is used to this strange behavior. Diana’s suffered from severe bipolarity for the past 16 years, and he has been “living on a latte and a prayer” and trying to get through another day all that time. But he admits that much of the time, he doesn’t know what she’s talking about. 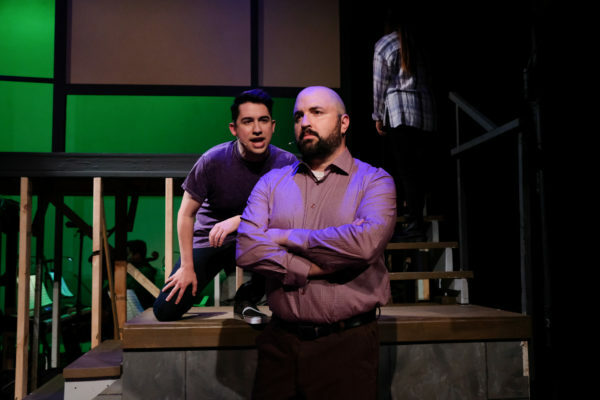 Chad Oakley directs Coronado Playhouse’s lovely production of Tom Kitt and Brian Yorkey’s Tony- and Pulitzer Prize-winning 2008 pop/rock musical “Next to Normal,” now playing through June 17. Bipolar disorder can’t be cured, but it can be managed, at least to a certain extent. Dr. Madden (Connor Boyd) offers three possibilities: medication, hypnosis and electroconvulsive therapy (ECT — or in laymen’s terms, shock treatments). Diana doesn’t trust hypnosis and strenuously objects to ECT for a very real reason. It frequently results in memory loss. But she doesn’t much like pills either, and after a while, like many bipolar patients, she just stops taking the medications. Her reasoning is summed up in the show’s best song, the poignant “I Miss the Mountains,” in which she decries the leveling effect of the pills. Meanwhile, 16-year-old daughter Natalie (Chloe Marcotte) has pretty much had to mother herself. Natalie is a budding pianist who could have used some motherly advice about classmate and new boyfriend Henry (Peter Armado). Diana has another problem. She’s never come to terms with the long-ago death of her infant son Gabe. In fact, she “sees” and talks to him (SeeJay Lewis) often, even bakes him a 17th-birthday cake, much to Natalie’s embarrassment (Henry had joined the family for dinner that night). 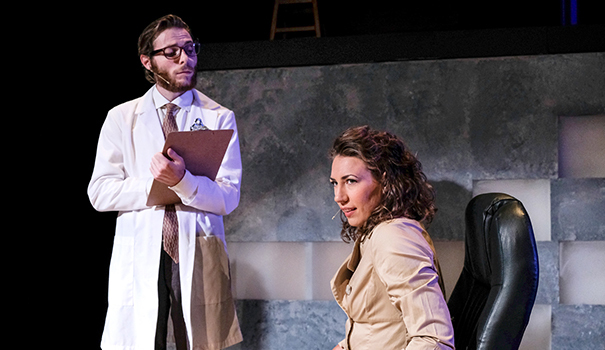 These are difficult issues to treat anywhere, let alone onstage, but Kitt and Yorkey give us such honesty and directness along with tenderness. And even humor in script and libretto, and this cast delivers at such a high level, we can’t help but engage and care about this family. Newcomer Rawhouser is a find as Diana, with a stunning voice and flawless delivery to go with her utterly convincing acting. Lewis’ phantom Gabe manages to be raw, scary, and heartbreaking all at once. He’s a talent to watch, with a powerful, lithe voice. I last saw him in OnStage’s fine “Spring Awakening,” and he’s better every time I see him. Armado is charming as Natalie’s persistent but often puzzled boyfriend Henry, who just wants to take her to the dance. Donovan is convincing as Diana’s loving but nearly broken husband Dan. Boyd’s voice isn’t as powerful as the others, but he’s convincing as the shrink who wants to help but knows he really can’t “fix” this problem. Kudos to music director/bassist Martín Martiarena’s fine six-man band that plays from the rear of the stage, too. Jacob Sampson’s dual-level set looks great (and properly angular), and Josh Olmstead’s lighting uses brightly colored, sometimes blinking lights to atmospheric advantage. 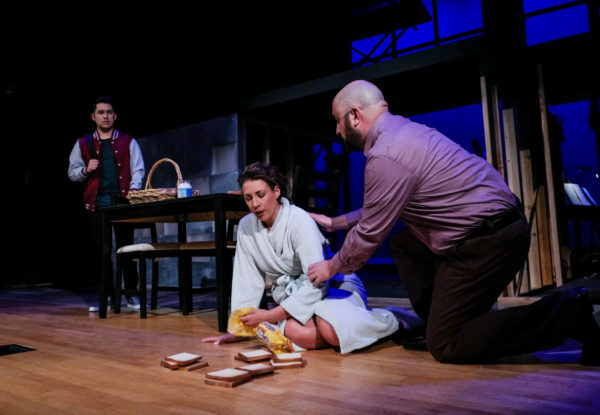 “Next to Normal” is an unflinching look at bipolar disorder and its effect on the Goodman family, with music to match. Sometimes unnerving (not to mention extremely difficult), sometimes lyrical, always appropriate. It will have its effect on you, too. The theater has appropriately placed tissues on each table. You’ll need them.